Want a new spice mix to dress up your chicken or steak? 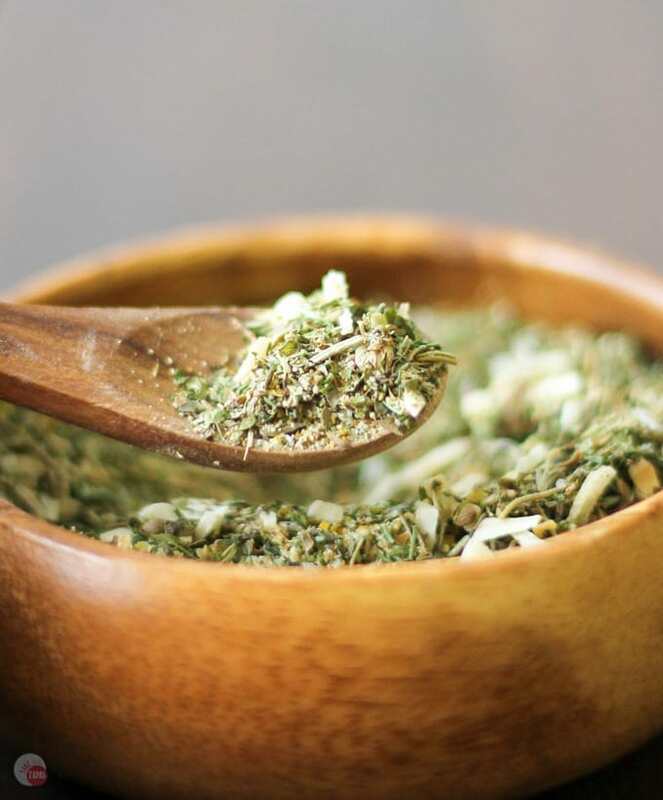 Try this Homemade Greek Seasoning Mix you can make at home! Need something to shake up your boring chicken dish and all you have are some spice bottles and all-purpose seasoning blend? 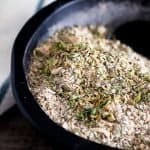 Make this quick and easy Greek Seasoning Mix and take a trip across the Atlantic while you are eating! I love making my own spice mixes. I used to buy them in the store but limited by the choices of pre-made ones to about 5 different varieties such as Cavender’s All-Purpose Greek Seasoning, in addition to the anti-caking agents and other chemicals, I started making my own. I even created my own hot spice mix when I hosted a “7 Deadly Sins” dinner as a party favor. I haven’t posted that recipe but it is coming soon. Just take me to the Greek Seasoning Recipe Already! 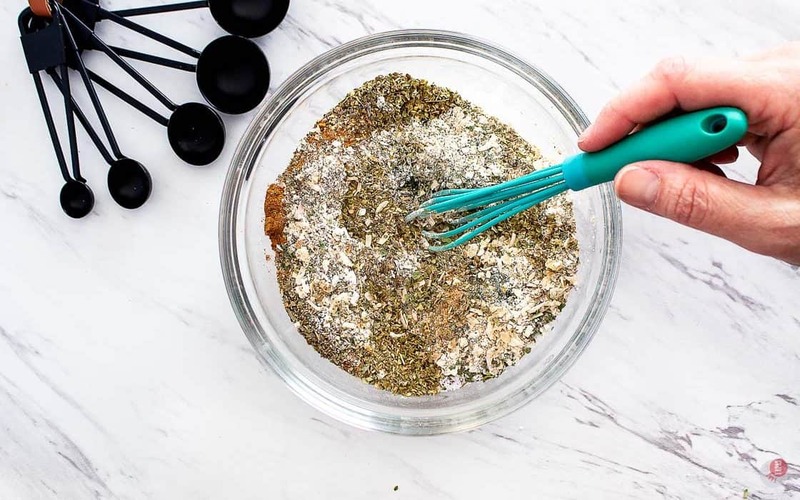 If you’d rather skip my (very helpful, I think) tips and tricks, essential cooking info, and similar recipe ideas – and get straight to this delicious easy Greek Seasoning recipe – simply scroll to the bottom of the page where you can find the printable recipe card. What can I use Greek Seasoning on? 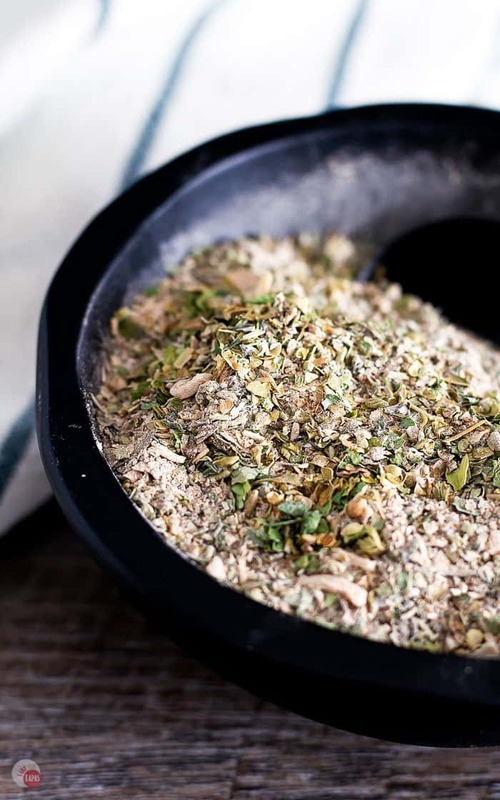 This Greek Seasoning Mix will take you on a vacation to the Mediterranean with all the flavors of oregano, thyme, and especially marjoram! Marjoram is included in every spice jar/spice rack that I buy. I see marjoram in the aisle at the store and never really knew what it tasted like so I had to buy some. Oregano is closely related to marjoram so I wondered why we use both in a lot of spice mixes. What is in Greek Seasoning and what are Greek Spices? I had to look it up and see why I add Oregano AND Marjoram in Greek Seasoning Mix. Mediterranean or Greek spices like Marjoram and oregano are both from the mint family. Oregano and Marjoram leaves look a lot alike but their flavors and aromas are quite different. Oregano leans to a stronger, slightly spicy flavor profile while Marjoram tends to be more on the sweet side with floral scents. Both are perfect for sauces, marinades, and dressings but since Marjoram is “lighter” I would add it at the end of any cooking process to avoid destroying its flavor. Did you know that this Greek Seasoning is Whole 30, Paleo, and Keto compliant? It is also gluten-free!! Q: Is Greek Seasoning Gluten-Free, Paleo, or Whole30 compliant? A: Yes, it is all three! And this homemade mix doesn’t contain MSG! The best benefit of making your own homemade spice mixes. Q: Is Greek Seasoning the same thing as Mediterranean Seasoning? A: They are basically the same only Mediterranean seasonings usually include cloves and cardamom. Greek seasoning contains marjoram that is not usually found in Mediterranean seasoning. Q: How do you store Greek Seasoning? A: The best way to store any of your spices or spice mixes is in a glass container, air-tight, and in a dark and cool place. Obviously not next to the stove, on the counter top, under a window with full sun. Unless you are planning on using the entire batch in a week. Q: How long with this Greek Seasoning last? A: If you store your Greek Seasoning as I talked about in the previous answer, it should last at least 6 months. If you are looking for a new way to dress up your dishes, or even make a new salad dressing, grab the spice bottles in your cabinet and throw together this Greek Seasoning mix. It makes a great hostess gift too! Grab this recipe for Greek Seasoning Mix and use it on my Greek Chicken Nuggets with Tzatziki Sauce! 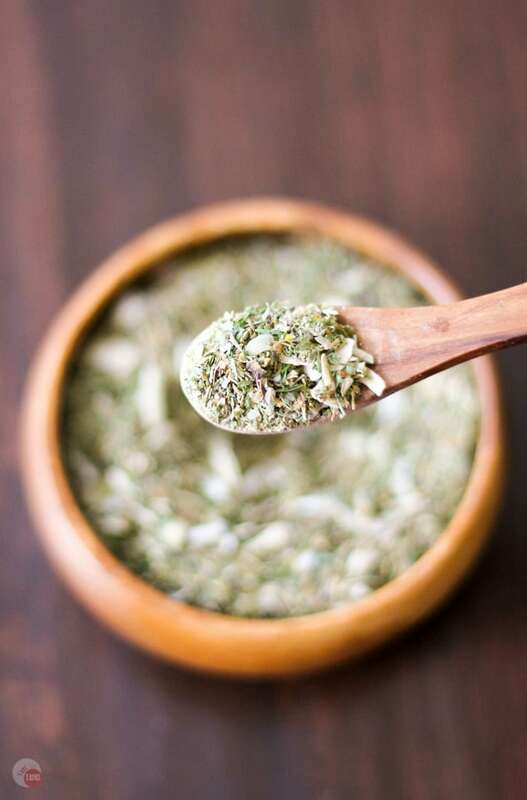 If you love this Easy Greek Seasoning Recipe as much as I do, please write a five-star review, and be sure to help me share on Facebook and Pinterest! Want a new spice mix to dress up your chicken or steak? 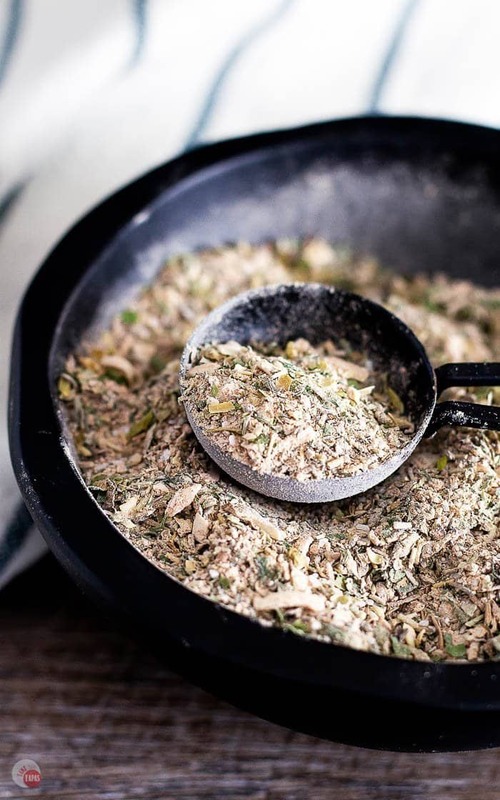 Try this Greek Seasoning Mix you can make at home! Mix all together and add to your favorite chicken or steak dish! Store in an air-tight container, preferably in a cool dark place. We LOVE this recipe. We went through it and now I am making it again tonight. It is wonderful on fish fillets. It’s light, yet perfect. We love it in deviled egg salad. I use it all the time. Mmmm, good. Thanks for this treat. I am so glad!! Thank you! Do you or can you blend these to make it a finer seasoning? I don’t typically grind this mix, but you can certainly do it. I use a mortar and pestle when I grind down my everything bagel seasoning so I can control just how fine I get it and I can’t really do that with a spice grinder. Or you can just add the spices that you want to grind down and then add the other ones after. Thank you! Are all of the herbs dried? Yes, they are. It makes it shelf stable. If you want to revive them, just rub the spice mix between your fingers or hands before adding to your food. I love how versatile this is! This would be so awesome to have on hand! We love Greek flavors and will be trying this very soon! Greek food is definitely one of my favorites! My mind is swimming with ideas to use this!! I love making my own spices, so much better and such great flavor! PLUS you know what’s actually in it! Your recipe sounds amazing!! I love making my own spice seasoning mix too! I use my taco seasoning all the time, but I don’t have a Greek mix! I’ll be making a couple of batches to have on hand. Thank you! This worked so well on some grilled chicken…. It was so easy to make and tasted great! I also used it with some olive oil and vinegar for a greek salad dressing…. hello yumminess! This looks so fresh and wonderful. Pretty colors. And I bet it’s fabulous on chicken. I’d also love to do a roasted chickpea with Greek seasonings! Yum! There’s a lot of great favor going on in this mix! It sounds so tasty and would be great used so many ways! I always make my own spice mixes and this one looks lovely! Such pretty photos, too! I’m so glad you share with us on throwback thursday because I’ve really been enjoying your blog! I love seasoning mixes! Thank you for linking up to last week’s Tasty Tuesday linky! I’ve pinned your recipes to the Tasty Tuesday Pinterest board and hope that you’ll join us again this week. I love mixing up my own seasonings. I’ll have to try your recipe soon. Thanks for sharing at the Inspiration Spotlight party. Have a great week ahead. Shared. This looks like a really delicious seasoning! Thanks so much for sharing your recipe with us at Share The Wealth Sunday! Oh, wow… this looks amazing!! I have most of the herbs planted and growing already. I may have to make a batch of this when I get a harvest of each! Thanks!! I never thought about making up my own spice mixes! Thanks for sharing on the What’s for Dinner link up! Loved your newsletter this week. It had me chuckling out loud just as here you about 2nd mortgage for the growing boy grocery bills. Seriously though where do they put it all???? This Greek seasoning is brilliant… great little grilling combo. 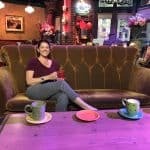 Sharing everywhere! Thanks so much! I feel like I need to take a few extra jobs just to pay for all the food!